All welded construction (except folding leg assemblies). Adjustable 2” square tubular legs (adjusts top height - 30” - 38” on 2” centers). Leg assembly - 1 bolt per leg. 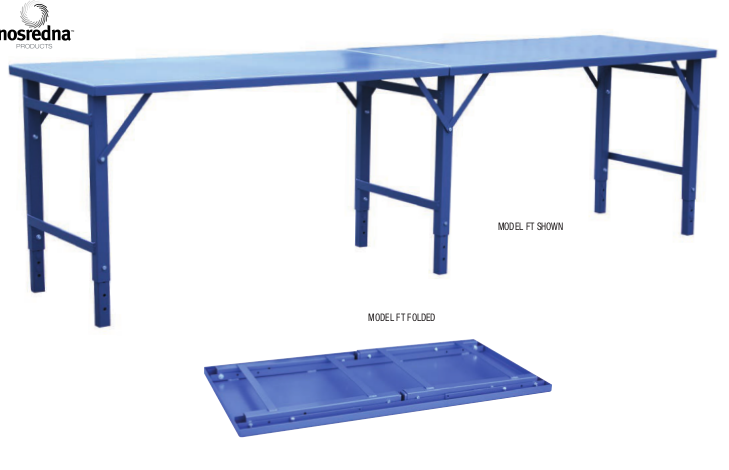 Durable 12 gauge table tops with twin channel under bracing. Starter Unit (leg assembly at each end) & Add On Unit (leg assembly at one end). beginning with 4 ft. starter, with no length limits. Tables are either 30” or 36” wide. NOTE: Starter units come in 4’, 5’ & 6’ lengths ...Add-on units come in 4’, 5’ or 6’ lengths. If ordering just an Add-on unit ... add suffix “AD” to model no. ...Example: A 6’ add-on (30” wide)...model no. would be “FT306-AD”.